I'm betting the toothbrush mustache never makes a comeback, tho. 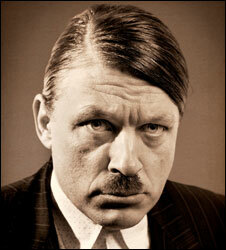 Richard Herring tried, with mixed results. Yah, he guested an episode of Have I Got News For You while he had it. It was not received well. Everybody wants to be like... Hitler? Who on earth would want to wear that ? A Moustache stalker, or someone incapable of growing their own. Hopefully no one.